The death of libraries, in our digital age, has been very much exaggerated, in fact, the potentially central role of the teacher-librarian in managing access to knowledge, has never been greater. However, the quiet digital revolution, taking place in libraries across the nation, has not always been matched in our schools. This article is a call to arms. Our community needs your advocacy and guidance now! Teacher-librarians are uniquely placed to forge coalitions that make a difference to the health of our democracy. Democracies flourish when their people are culturally literate and engaged citizens. 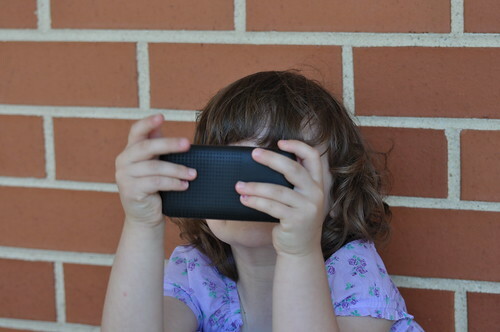 Our culture, our communities, our children, need savvy guidance to traverse the digital landscapes of the 21st century. We need teacher-librarian advocates who are able to coordinate and lead. We need teacher-librarians who can dance the steps and guide us all in becoming powerfully critically literate digital citizens. I am not a teacher-librarian but feel passionately about the future of reading and libraries. 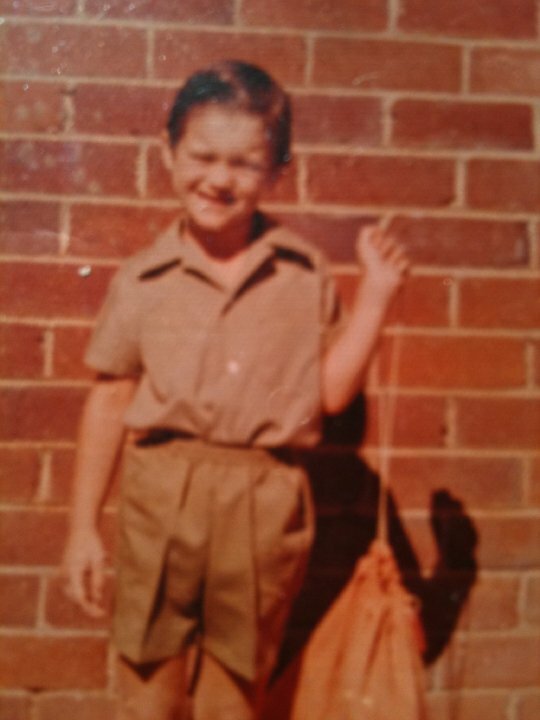 Always a passionate reader, my very first day of kindergarten, recorded for posterity by Mum, shows me well-prepared for success at school as a bright orange library bag is clearly evident. I can honestly say that very few weeks have elapsed in the last four decades where I have not borrowed from a library. Currently, my office, where I work as a deputy principal at a large state high school, is located in our school library and I work closely with the teacher-librarian. Libraries have always been important to me personally, as they are to my 7 and 10 year old daughters who read avidly, as well as play Minecraft and many other games on the same devices they access novels from their online local library. There is no hierarchy to it, we just use most of the above most weeks of the year. Occasionally we use free sites, like Project Gutenberg or Librivox, to access materials too. 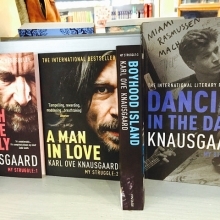 Of course, there are also many free books accessible via Kobo and a variety of other e-reader apps we have tried. What about you? Do you basically do the same as my family? If not, how is it different? What about your students? I desperately hope that you read ebooks and access them from a variety of sources in order to show students how to do so. 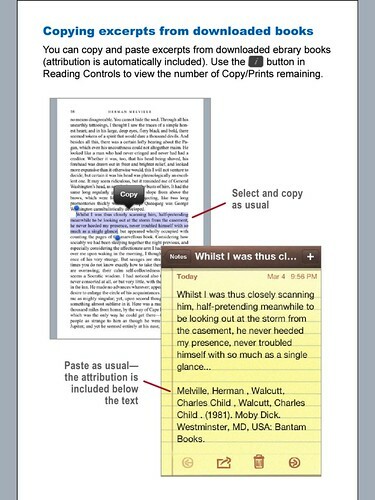 Increasingly you will have to show them how to clip quotes, share them online or make notes with digital tools. There is a great opportunity here as many schools are encouraging BYOD and students will potentially be able to access the collected works of our culture at all times, from their own personal device. This is much better than what I could do with my bright orange library bag. With one simple innovation, our school has been supported by the local municipal librarian to assist students access their collections in 2014. All students will be issued with their local library card as part of our process, at the beginning of the year, for distributing school photographs. Students will need to return, ironically, a paper form enabling the librarian to issue each student with their card that permits access to the extensive ebook and audiobook collections. 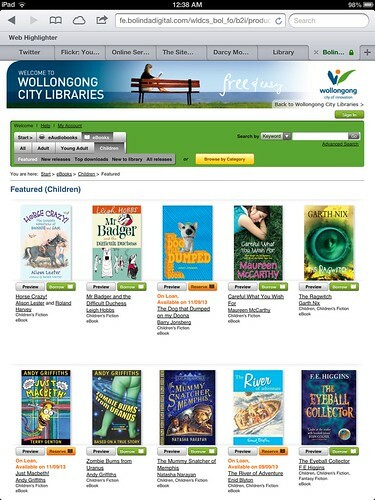 If you visit any local library homepage there is now access to ebooks and audiobooks. Most libraries are using the Overdrive and BorrowBox apps for iOS and Android devices but Bluefire Reader and ebrary are also popular (amongst a plethora of other options). Now, our teachers will be able to ask students to ‘visit’ their local library online. We envisage the teacher-librarian being integral to this process, with classes having demonstrations in our school library, of how to use the online system. We believe there will be more access to the physical spaces of both the municipal and school library as a result. Sharing online is the norm for our students. Teenagers share music and video clips via Facebook (and a plethora of other social networking sites) from their devices. There is no reason why books cannot become part of their ecosystems too. There is data to suggest that audiobook usage is growing exponentially, especially amongst the younger generations, as access is becoming easier and less expensive. As a deputy principal, I often show reluctant readers how to find audio versions of books they may enjoy (or have to study). These opportunities for student engagement, as well as growing their understanding about how data is used by corporations, are discussed in an article I wrote about ‘social reading’ (“Social reading: fad or future?”, mETAphor Edition 3, 2012). Digital citizenship is a key issue and the teacher-librarian has a key role in ensuring students (and staff) understand the opportunities and challenges. 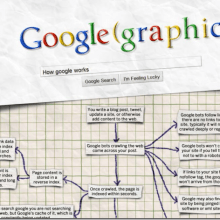 Understanding sharing online is too important to be left to educational chance. Professional teacher-librarians must make it a priority and place themselves at the centre of a BYOD revolution that involves books, not just websites or Learning Management Systems. It is critically important that the professional teacher-librarian becomes an effective advocate for change and helps students and colleagues understand and take best advantage of our digital age. Nothing less than our democracy and the future of our country is at stake. We cannot allow libraries to die and reading to decline. Thinking about BYOD in schools and the quiet online revolution taking place in our libraries has led me to the conclusion that it is very possible for students to access books and journals at relatively little expense. Students in Australian schools could be given access to a wealth of pre-existing online books and journals with just a little coordination by the state. If South Australians have one card for all libraries, why can’t this happen for the citizens of NSW? In an era when families are being asked to provide their own laptops and tablets, in an effort to reduce both government and school IT expenses, the state could use resources to assist with content for students and schools by coordinating access to digital infrastructure that has been developed by government institutions in recent years. The municipal, state, university and national libraries who are funded largely by the taxpayer, should have more citizens accessing their online catalogues. Once students realise how easy it is to find free ebooks and audiobooks – accessible on a wide variety devices, via web browsers or apps like BorrowBox, OverDrive, ebrary and Bluefire Reader – community usage will likely grow rapidly. It should be a relatively easy enterprise to extend access to our students and teachers in state (and other) schools with just a little coordination. It seems a simple concept to have one library card for NSW libraries but who has the will to coordinate such access for the children and citizens of our state? Barry O’Farrell, the Premier, sent an encouraging ‘tweet’ which provides a start in the right direction towards this goal that you can also pursue via professional associations and politicians. 5. Be the change you wish to see in others and convince the principal of your central role in the learning life of the school. Now you are at the end of the article, I truly hope you were not too annoyed with my presumptuous advice. In fact, my hope is that you thought, ‘I am already doing all this and more’ rather than any of it being ‘news’. It is evident that children need the professional advocacy of teacher-librarians if our democracy is to be strengthened. For years I have encouraged teacher-librarians, in my articles, conference presentations and blog posts to build a Personal Learning Network (PLN) of savvy colleagues using tools like Twitter. Are you blogging about your 21st century library, your reading, great books, digital tools and advocacy publicly? If not, start right here, right now. There’s too much at stake to leave it to others. Excellent article Darcy. I also liked your latest contribution to Metaphor. I work closely with my school librarian, Katherine Hannaford. No doubt you know her. Her technology knowledge and ability to work around access issues are essential to extend our students’ learning. She plays a critical role in assisting students with the information skills process! Our library is busting at the seam every recess and lunch! That says it all I think. Where would we be without our school librarian. Love the potential BYOD and all of these borrowing apps allow. Reading has been a favorite family hobby. I and my wife are considering making our reading activity more digital via mobile apps. But you know what, traditional libraries with all those books will always be a first love. And yup, making libraries more modern and contemporary will surely make a difference. Cool post here! Keep up! Apologies for the font problem. Slideshare didn’t like that one obviously.